The maritime regions of Québec offer 6000 kilometres (3700 miles) of marked and groomed snowmobile trails dotted with rest areas and near gas stations, accommodations and restaurants. Touring these regions by snowmobile is a spectacular experience: you can take your sled across the St. Lawrence by ferry as well as ride across the Manicouagan River on North America’s longest snowmobile bridge. Take in scenery that is inaccessible at any other time of the year and enjoy a unique winter experience in Canada! Whether you are an experienced and avid snowmobile enthusiast or just want to ride the trails to admire spectacular scenery, our regions offer a variety of trail options and snowmobile packages for every taste and budget. From Kamouraska to Rimouski via Rivière-du-Loup and Témiscouata, the snowmobile trails of Bas-Saint-Laurent will take you through picturesque villages and spectacular scenery. Ride across the only ice bridge to an island in the St. Lawrence and observe winter feeding areas for white-tailed deer. This region is particularly suited for loop rides. Boasting 3000 km (1900 mi.) of snowmobile trails and excellent snow conditions, Gaspésie is a popular snowmobile destination in Canada. You have many options, including riding along the coast or through the Chic-Choc Mountains or the Matapédia Valley. The renowned Bas-Saint-Laurent – Gaspésie Snowmobile Tour will take you to the tip of the peninsula where you can admire Percé Rock surrounded by ice. From Tadoussac to Blanc-Sablon, Trans-Québec trail #3 follows the St. Lawrence for 1640 km (1020 mi.). Ride across rivers on dizzyingly high bridges and admire landscapes shaped by the sea. Adventurer lovers will want to explore the Lower North Shore, where snowmobiles are the only form of land transportation in the winter, and visit a string of French-speaking, English-speaking and Innu villages along the way. For information about trail permits or to purchase your permit online, visit the Fédération des clubs de motoneigistes du Québec (FMCQ) website or the Info Motoneigiste Gaspésie website. 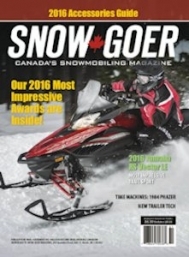 For more information about snowmobile regulations, visit the Québec Federation of Snowmobile Clubs (FCMQ) website.